All-About-Aussies-(Australian-Shepherds)! | Learn and comment about the Australian Shepherd. Written by Jeanne Joy Hartnagle-Taylor, from the Hartnagle-Las Rocosa family. The Australian Shepherd may have to trail stock for many miles and at any given moment be able to display great bursts of speed to outrun and turn a maverick. He often employs many forms of gait during any given day. His ability to maneuver quickly at full speed is referred to as agility. The dog that is able to cover the greatest amount of steps without sacrificing agility is ideal. In other words, the moderately angulated, balanced individual is the most functional and therefore the most desirable. The gait most often chosen to assess correct gait is the trot. This is a symmetrical gait in which the legs of either side repeat the actions of the other side, but they do so a half a stride later. The trot is a gait of medium speed in which the dog is supported by alternating diagonal pairs of limbs. The forequarter legs are off the ground only a split second longer than the legs of the hindquarter to allow the front feet to clear the ground in advance of the placement of the hind legs on the same side. When the front foot leaves the ground, the hind foot takes or “fills” its place. When the Australian Shepherd shifts from the walk into an easy, slow trot, the gait is called “collected.” In the “extended” trot, the legs reach out to increase stride length and speed. (The length of stride is measured from the place where one paw leaves the ground to the place where the same paw again strikes the ground.) When a period of suspension occurs between the support phases and propulsion, the gait is referred to as a “flying” or “suspended” trot. It can take many years of observation to apply knowledge of gait. The interplay of strengths and weaknesses between fore and hind assemblies is more clearly revealed in the trot than in any other gait. By viewing the Australian Shepherd at a trot from the side you can see the interaction of the forequarters with the hindquarters. The Aussie’s gait suggests endurance. There is an effortless quality in the stride, which is deliberate without wasting energy. The most effective movement does not always stand out and attract attention. However, its quality is never mistaken because all parts harmonize without disrupting the interworking of other parts. When viewed from the side the dog’s topline should be strong and appear level between the shoulders and the loin. When the dog is trotting there should be no bobbing, as the withers should remain level in motion. Any up-and-down movement wastes energy and indicates another structural inefficiency. Precision foot timing is absolutely necessary for the tireless trot when working. Sometimes while in the working gait, the Australian Shepherd may drop his head slightly. When alert or focusing his attention on something, however, he can lift his head while in motion. Actual body length determines foot placement, which is governed by angulation. The Aussie is slightly longer than he is tall. Balance and symmetry are the first and foremost requirements in a working breed. This is influenced by correct static conformation, but is measured by the yardstick of performance. Correct shoulder angulation that allows adequate reach but that lacks the corresponding angulation of the driving hindquarters is of little value. This kind of dog cannot “fill” his fore tracks and ends up wasting energy. On the other hand, an Aussie with well-angled hindquarters and insufficiently angulated forequarters overdrives the front assembly by forcing the front feet and legs to get out of the way of the back ones, causing faults such as dwelling and crabbing. Condensed from All About Aussies, copyright © 2009 by Jeanne-Joy Hartnagle-Taylor. You often hear about reach and drive, but what about feet? Feet support the entire body weight of a dog. The front feet support 60% to 75% of the dog’s weight. As a result, the front feet are slightly larger (broader) than the hind feet. Therefore, correct, sound feet are essential since poor feet can limit athletic ability and lead to impaired performance. Weak feet (splayed, flat, and broken down) are more easily affected by rough terrain and are vulnerable to both wear and injury. Splayed and flat feet are serious faults because they lead to early breakdown and lameness. Splayed feet expose the webbing to injury. What causes feet to splay? The tendons and ligaments that hold the digits together are lax so the toes spread apart. It’s generally an inherited defect, but can be caused by an injury. When that happens, it will appear in the injured foot only, not in any of the other feet. Long toenails can increase force placed on the digits (toes) and predispose them to fractures and other injuries. The breed standard states “Feet are oval shaped.” The oval shaped foot described in the breed standard is a semi-hare also known as a modified hare-foot. The modified hare-foot is the most functional type of foot for the Australian Shepherd, a breed that needs to be able to trot for certain distances, change directions, or alter gait instantly in rugged terrain. The longer third digital bones are also helpful for the type of quick initial speed needed for outrunning errant livestock. The breed standard also states the foot pads should be thick and resilient. Why? The foot pad is where the “rubber meets the road.” This padding is important for traction, shock absorption, and protection from rocky surfaces, briars, thorns, ice granules etc. Thin pads should be faulted. When the heel pad – the central heart-shaped pad – of the foot is thin and poorly developed it causes a dog to stand on the back part of their foot. The third digital bone isn’t adequately supported and the dog’s weight isn’t uniformly dispersed which is evident when the four smaller digital pads tip upwards. This type of foot exposes the feet and webbing to injury and causes the foot to break down. “Pasterns are short, thick, and strong but still flexible, showing a slight angle when viewed from the side.” Why? The pasterns (metacarpus) work in conjunction with the foot. The pastern expands which helps absorb external forces which in turn minimizes the stress on the bones that form the toes. 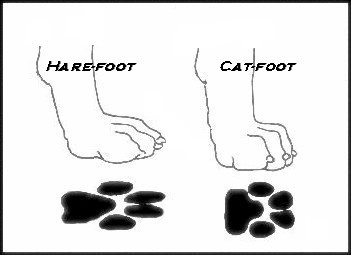 *Don’t mistake broken-down cat-feet for the hare-foot which appears somewhat flat. Flat, broken-down feet, those lacking sufficient padding, and splayed feet should be penalized harshly. 2. True or False. An Aussie built with the type of shoulder layback that produces a trotting style with good reach and drive is more agile than an Aussie with less slope (slightly steeper shoulder angle). 3. What is the functional trade-off for an Australian Shepherd with well-let down (short, close to the ground) hock joints, flatter pelvis and well-laid back shoulders versus an Aussie with longer hocks, a slightly steeper croup and pelvis? 4. True or False: An Australian Shepherd with large bone is better built to withstand the impact of a cow kick than an Aussie with smaller bone. 5. True or False: The difference between the cat foot and the hare shaped paw is the length of the third digital bones. 6. True or False: The compact catlike foot is designed for quick speed and jumping ability. 7. True or False: The mechanical advantage of the hare shaped foot is quick speed, turns and jumping ability. 8. True or False: Long hocks (metatarsi) contribute to speed and agility. 9. True or False: The slope of the croup indicates the backward extension of the hind feet. 10. True or False. An Aussie built with shoulders set at an angle that produce a trotting style with maximum reach and drive is more agile than an Aussie with less slope (slightly steeper angulation). 11. True or False: There is a recognizable difference between the basic structure of working and show bloodlines. 13. True or False: The 45 degree angle for the “well-laid back” shoulder described in the breed standard is nonexistent. 14. True or False: The Australian Shepherd is a long-distance trotting breed able to cover as much ground as possible with as few strides as necessary. 1: C. Dog Locomotion and Gait Analysis by Curtis Brown. It was also quoted in the Total Australian Shepherd by Carol Ann Hartnagle and Ernie Hartnagle. 2. False. Shoulders that are set well-laid back are designed for sustained, long distance trotting. 3. False. The trade-off is quickness and agility. 4. False. Research suggests that large bones are more porous than smaller, more moderate size bones (when comparing healthy animals of the same size and age). 5. True. The two center toes in the hare foot are noticeably longer. They are not as highly arched as the cat foot either. 6. False. The shorter digital bones lack the necessary leverage action required for quick turns and agility. The catlike foot is designed for effortless, long distance trotting because it takes less energy to lift, thus increasing endurance. 7. True. The longer toes of the hare foot give more leverage for quick speed and agility. 8. True. Short hocks aid endurance for sustained trotting. 9. True. A flatter pelvis is designed for sustained, long distance trotting, while slightly steeper pelvic angles are designed for speed and agility. 10. False. Shoulders that are set are well-laid back are designed for sustained, long distance trotting. 11. True. Australian Shepherds from working bloodlines tend to have less shoulder layback (less slant compared to the vertical plane), a little steeper croup (pelvis), longer hocks and a shorter, quicker stride than their show cousins. 12: D – None of the above. The breed’s tendency for slightly straighter shoulders, a little steeper croup (pelvis) and longer hocks which produce a shorter-quick stride is due to the breed’s original, historic function as a quick and agile working stockdog. There is a popular misconception that slightly steeper angles indicate incorrect angles and therefore produce faulty gait. As long as the individual is in balance (shoulder angulation of the forequarters is in harmony with corresponding angles in the hindquarters) the gait will be even. 13. True. It has been proven to be a misleading notion. 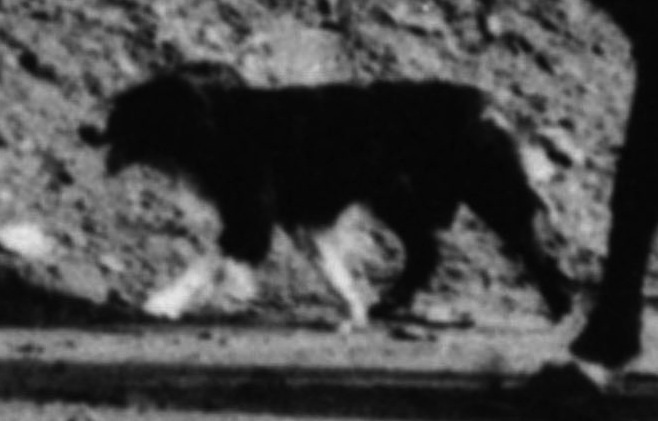 The 45 degree shoulder was based on McDowell Lyon’s 1950 book, The Dog in Action: A Study of Anatomy and Locomotion when the ASCA Breed Standard was originally drafted and approved in 1977. Modern research has since proven this theory to be a myth. The croup with 30 degree slope (to the ground) described in the breed standard corresponds to the 45 degree angle of the shoulder. 14. False: The historical function of the breed is to work livestock. In order for the Aussie to perform the tasks of his original function he must be able to trot for certain distances as well as make instantaneous gait changes, quick and sudden turns and abrupt stops over varied terrain in close proximity to hooves and horns. The longer extension of gait produced by well-laid back shoulders and a flatter croup naturally produces a slower reaction time to negotiate changes of direction. 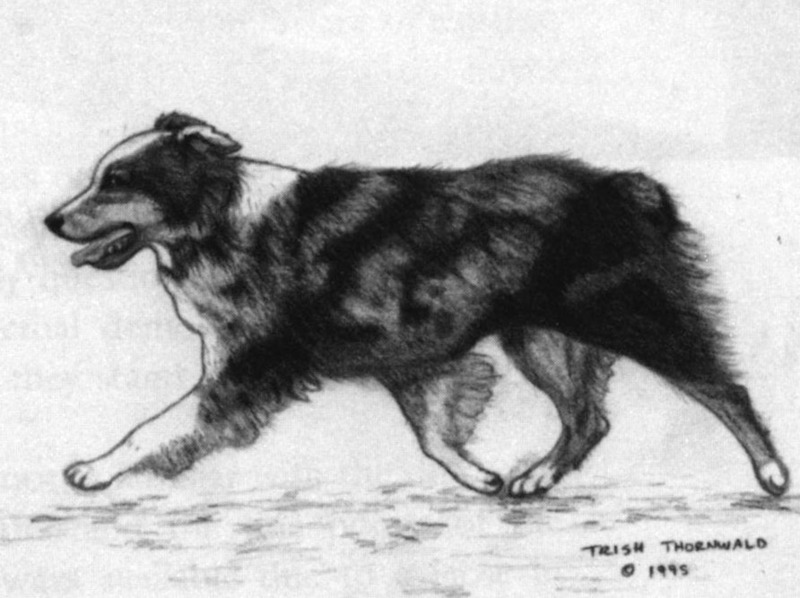 A dog built for sustained trotting requires an extra stride or two to alter gaits or change direction.The type of structure that best enables the Aussie to perform his inherited duty as a working stockdog is a moderate set of angles (not straight like a Chow, but not well-laid back like a German Shepherd Dog). 15. False. The topskull and muzzle pictured in the logo are oblique (non-parallel). The top portion of the skull slants or slopes very slightly towards the muzzle. Get a protractor and check it out! The slope or gradient of the line of the top skull (occiput to the stop) when extended will eventually intersect with the line of the muzzle (the stop to the tip of the nose). By contrast parallel lines remain the same distance apart and will not meet, no matter how far you extend them. The severe fault on prick ears has been a blight on our breed. Prick ears are naturally occurring among the bloodlines. A few of the foundation Aussies that had prick ears include Wood’s Dandy, Mansker’s Freckles, and Smedra’s Blue Mistingo. In 1975, our registry was operating in its third year. The Breed was not yet established. We had set up viewing committees to accept dogs for approval. We had no official guidelines, and most of the existing Standards were little more than dumpster quality. The first official Standard, the one that we are using today, was approved by the membership in 1977. Dr. Robert Kline chaired the committee, with a number of qualified veterinarians as consultants. There appeared to be an existing concern that some of the viewed dogs accepted by the viewing committee were possibly not entirely of pure Australian Shepherd breeding, most of which were endowed with prick ears. The Breed Standard Committee, in needless desperation, agreed to list the prick ear set as a serious fault. They felt that this stop gap remedy would focus attention on the prick ears to discourage acceptance of these questionable individuals into the breed. This move proved to end in dismal failure. In retrospect, this was unwarranted, unproven, thoughtless overkill by the committee. We, at that moment, unknowingly put a millstone around our wonderful working Aussies and have blighted his very existence and prestige among the five most popular working breeds used today. Ironically, most of these breeds support prick ears! And yet, we are the only one that needlessly faults the prick ear. When prick ears were severely faulted breeders started taping their dog’s ears to their heads. Some even had them surgically cut which took away any lift. Therefore, we started seeing a majority of dogs in the show ring that had ears that couldn’t lift. If prick ears are only a fault rather than a severe fault people might be less inclined to tape them, especially if ears with no lift are severely faulted. In an interview, Louis L’Amour once said, “Historians follow the main line. One historian follows another one, adding maybe a detail here and there or questioning something the other fella has said. They don’t go off to the right and left and they don’t go out there in the boondocks to see what was happening.” But that is what has occurred with the history of the Australian Shepherd. Much of the breed’s written history was compiled by dog historians whose association with the early Aussies was no closer to the subject than a library shelf. The thoroughly researched “facts,” for the most part, are gleaned from library sources and then laced with suggestion and imaginary reasoning, “probably was,” “would have been,” “may have.” The eyewitness accounts from actual owners who knew and used the breed were, in most cases, discounted for lack of published documentation. One historian’s view, which has been published over and over, proposes the Basque and Spanish herders and their sheepdogs had very little to do with the breed’s foundation stating, “It appears that the theory of Basque origin probably came about from the understandable assumption by some breeders who obtained their first dogs from Basque sheepherders, that the dogs themselves must be of Basque background, and it makes a romantic picture to envision the Basque sheepherders being followed around the world by ‘their little blue dogs,’ but this picture, nonetheless, is erroneous.” Another author wrote that many of the Basque immigrants to both Australia and North America were not shepherds in their homeland. In actuality, the Basques who lived along the coast at the western end of the Pyrenees were fisherman and have a long history with the sea. However, those living inland were among the earliest people to domesticate animals and sheepherding has been a way of life for them since the beginning of time. Not all Basques who came to the United States to herd sheep on western ranges were shepherds in their homeland. However, a fair number of were, and when they came to the United States they brought their dogs with them. They arrived on a three-year visa under contract the Western Range Association. Large numbers of Basques with their sheepdogs were recruited to the western sheep ranches due to the labor shortage created by the war. During WWII, The Western Range Association negotiated an agreement with the government of Spain to recruit sheepherders. “Severe labour shortages in the 1940s led to Public Laws 587 and 307 in 1950 and 1952, respectively, which authorized recruitment of greater numbers of Basque sheepherders (Land & Douglass, 1985). Basques came by the thousands from Spain to Idaho, where they comprised much of the work force in sheep operations.” But, in the mid-1950s, with the return of troops from Korea, Idaho sheepmen lamented that ‘the Immigration Department started sending our Basque herders back to Viscaya…and we had to work out an agreement with the Department of Labor to secure H-2 status [for the sheepherders]’ (Shadduck, 1990). “By the mid-1950s, labour had become a serious problem and, in 1956, Drumheller hired Gregorio Zorrozua as foreman who soon hired an exclusively Basque crew of herders and tenders (Washington Wool Growers, 1983). Despite references that insisted that few Basque immigrants had previously worked as sheepherders (Douglas & Bilbao, 1975), sheepmen in Washington State recruited Spanish Basques who had worked with livestock for many years before their arrival in America, including ‘herding sheep for a transhumant outfit that trailed from the arid lowlands to the Pyrenees summer ranges’ (McGregor, 1982). The Drumheller sheep business lasted until the 1970s. *1. Roche, C. T., Vilatersana, R., Garnatje, T., Gamarra, R., Garcia-Jacas, N. Susanna, A., Thill, D. C., “Tracking an invader to its origins: the invasion case history of Crupina vulgaris,” Weed Research, Volume 43, Issue 3, European Weed Research Society, 2003. Note: The Warren Livestock Company ran 25,000 head of sheep over 284,000 acres between Casper, Wyoming, and Greeley, Colorado. It was one of the largest sheep companies in the west. When Jay Sisler was a little boy, he wanted to be a sled driver in Alaska. He taught his father’s bird dog and some of the family’s cow dogs to pull him around the ranch on a cart. Jay’s professional career as a dog trainer began by accident. He was working with horses when he got stepped on and broke his ankle. While he was healing, he taught his two young cow dogs tricks. Jay’s philosophy was to never force a dog to do something but to persuade it to do the behavior voluntarily. For example, if to teach a dog to stand, he wouldn’t lift him into position; instead, he coaxed the dog into position. He felt that you had to take the necessary time to teach a pup slowly. If you pushed a dog into something he couldn’t do or understand, he would become discouraged and wouldn’t be able to do what was expected of him. Jay got his first job in 1949, when a promoter offered him $10 to perform at a rodeo in Star, Idaho. That launched his rodeo career and opened the door into show business. Besides performing at many of the largest arenas in the United States and Canada, he toured with Roy Rogers and appeared on The Ed Sullivan Show. His dogs were featured in several Walt Disney productions: Cow Dog (1956); Run, Appaloosa, Run (1967); and Stub: Best Cow Dog in the West (1973), featuring his Australian Shepherds, Stub, Shorty, and Queen, performing their trademark tricks and working an ornery 1,800-pound horned Brahma bull in the picturesque Santa Inez Valley. In 1959 Jay purchased the 300-acre property he had worked as a boy and paid for it with the earnings from his highly successful rodeo act — he said it was “a ranch the dogs bought.” Part of the property is set on a plateau overlooking a valley bordered by the Payette River on the south. Jay was called to greener pastures in 1995, but his extraordinary way with animals will continue to inspire generations to come. Copyright © 2010 by Jeanne Joy Hartnagle-Taylor. All Rights Reserved.